Corbotch Memo: An Apex Predator Exclusive! This week, our archivist team is pleased to release our fourth document from the Dasnoe Expedition collection. Dubbed the Corbotch Memo, it offers disturbing background on the upcoming Apex Predator world. We’re pleased to release the fourth document of our Dasnoe Expedition collection today. The Dasnoe Expedition was led by famed zoologist Professor Joseph Dasnoe. Back in 1904, he received permission from the Corbotch Foundation to visit northern New Hampshire’s vast—and largely unexplored—Vallerio Forest. Accompanied by numerous Highforth College faculty members and students, Dasnoe set forth on September 24, 1904. Just four days later, he was forced to cut the expedition short when six students fell prey to a pack of animals, widely reported in the media as wolves. Professor Dasnoe spent the rest of his short life trying to convince an uncaring public that the creatures who’d attacked his expedition weren’t wolves. Today, we’re pleased to share the Corbotch Memo with you. Prepared by famed financier Miles Spencer Corbotch, it dictates a series of protocols designed to keep the truth about the Dasnoe Expedition under wraps. The last protocol is particularly chilling. Thanks again to all of you early purchasers of Vapor. Going forward, I intend to use this space to talk about the coming Apex Predator series. But first, I’d like to pitch Vapor one more time. 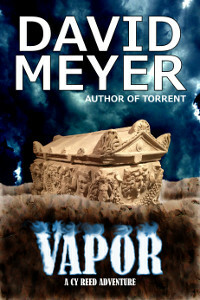 Vapor is the fourth novel in the Cy Reed Adventure series. Get your copy at one of the following links today! Dasnoe Monster: A First Look? 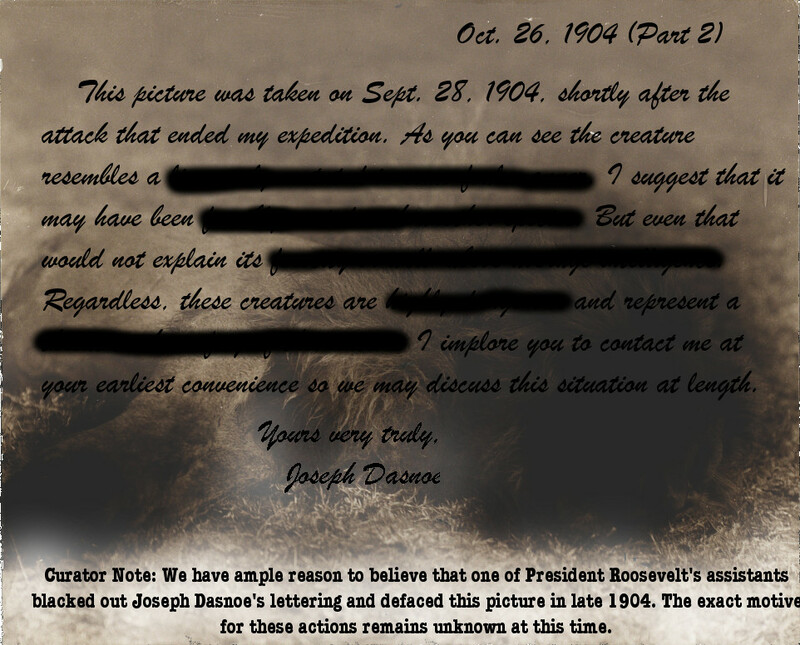 It’s Apex Predator Thursday here at David Meyer Creations and you know what that means … another document from the ill-fated Dasnoe Expedition of 1904! This week, we get our first glimpse of the strange Dasnoe Monster that reportedly attacked Professor Joseph Dasnoe’s expedition, killing six students in the process. In other news, the first Apex Predator book, Behemoth, is coming along right on schedule. 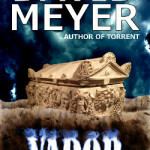 While you wait for it, why not check out my latest Cy Reed novel, Vapor? We’re pleased to release the third document of our Dasnoe Expedition series today. The Dasnoe Expedition was led by famed zoologist Professor Joseph Dasnoe. Back in 1904, he received permission from the Corbotch Foundation to visit northern New Hampshire’s vast—and largely unexplored—Vallerio Forest. Accompanied by numerous Highforth College faculty members and students, Dasnoe set forth on September 24, 1904. Just four days later, he was forced to cut the expedition short when six students fell prey to a pack of animals, widely reported in the media as wolves. Professor Dasnoe spent the rest of his short life trying to convince an uncaring public that the creatures who’d attacked his expedition weren’t wolves. Today, we’re pleased to share the so-called “Dasnoe Monster” photograph with you. It’s the second of a two-part message Prof. Dasnoe sent to President Teddy Roosevelt roughly a month after the attack. You can find the first part here. 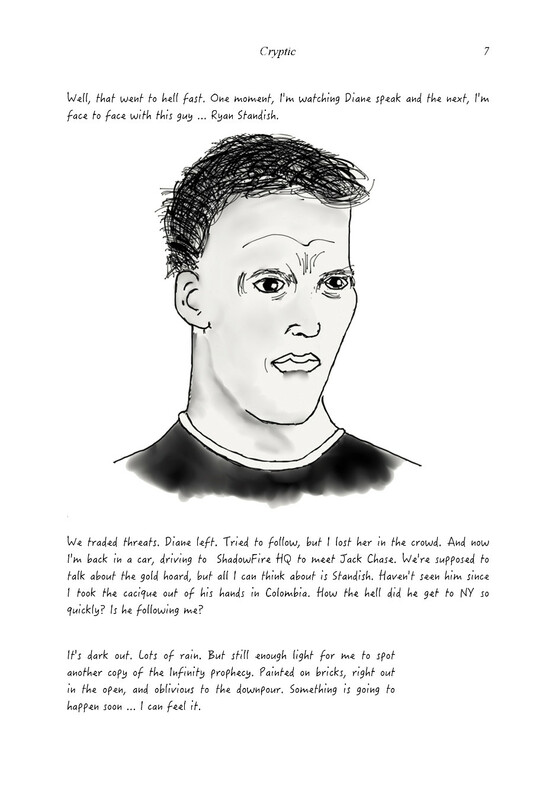 Unfortunately, the Dasnoe Monster image, along with the accompanying text, was defaced by an unknown party shortly after being received. Please see the curator note for more information. Our Apex Predator site is still growing. So, make sure to stop by and leave a comment. We’d love to hear from you! The first novel in the Apex Predator universe, Behemoth, is still being written. But you can get Vapor right now! Vapor is the fourth novel in the Cy Reed Adventure series. As we speak, it’s sitting at #9 & #3 on the U.S. and UK Pulp Best Sellers lists and #22 & #19 on the U.S. and UK Men’s Adventure lists. 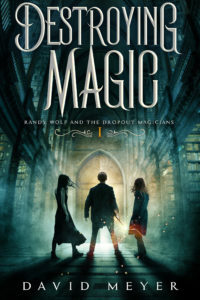 It’s also the #3 & #4 Hot New Release in the U.S. Pulp and U.S. Men’s Adventure categories. Get your copy at one of the following links today! Today, we’ve got another Cryptic page for you. It’s titled, “Cy Reed meets Captain Jellybones” and reveals that the Infinity has struck a blow against Manhattan … the apparent kidnapping of eight children from some of New York’s wealthiest families. What will Cy Reed do now? 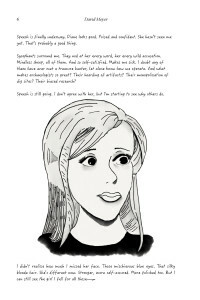 In other news, have you read Vapor, Cy Reed #4, yet? If not … why not? Get your copy today! 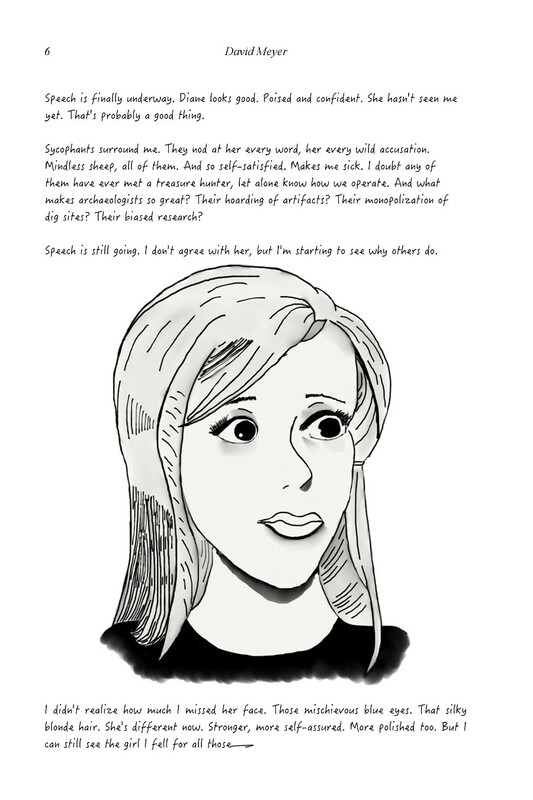 We’re releasing our ninth page of Cryptic today and as you’ll see soon, things are really picking up speed. Cryptic, as most of you know, is our working title for Cy’s personal journals during the time period encompassed by Chaos. 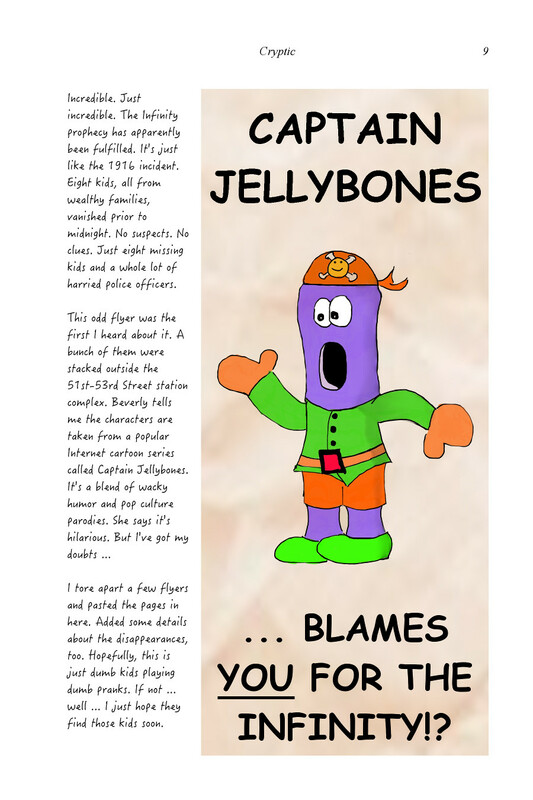 This week’s entry, “Cy Reed meets Captain Jellybones,” was written after Cy first broke into New York’s closed-off subway system. It features a flyer Cy collected just outside the 51st-53rd Street station complex. As you can see below, the flyer depicts characters from Captain Jellybones, a popular Internet cartoon series. As of today, we have yet to locate the person or persons that created this flyer. 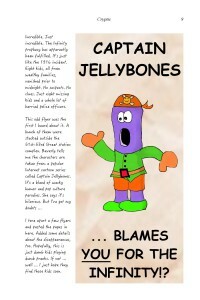 However, we do know that Captain Jellybones‘ creators had nothing to do with it. Have you bought Vapor yet? No? Well, why wait any longer? Vapor is the fourth novel in the Cy Reed Adventure series. As we speak, it’s sitting at #9 & #1 on the U.S. and UK Pulp Best Sellers lists and #18 & #13 on the U.S. and UK Men’s Adventure lists. It’s also the #3 & #6 Hot New Release in the U.S. Pulp and U.S. Men’s Adventure categories. Get your copy at one of the following links today! Last week, we announced our brand-new Apex Predator site and revealed the first document from the ill-fated Dasnoe Expedition of 1904. 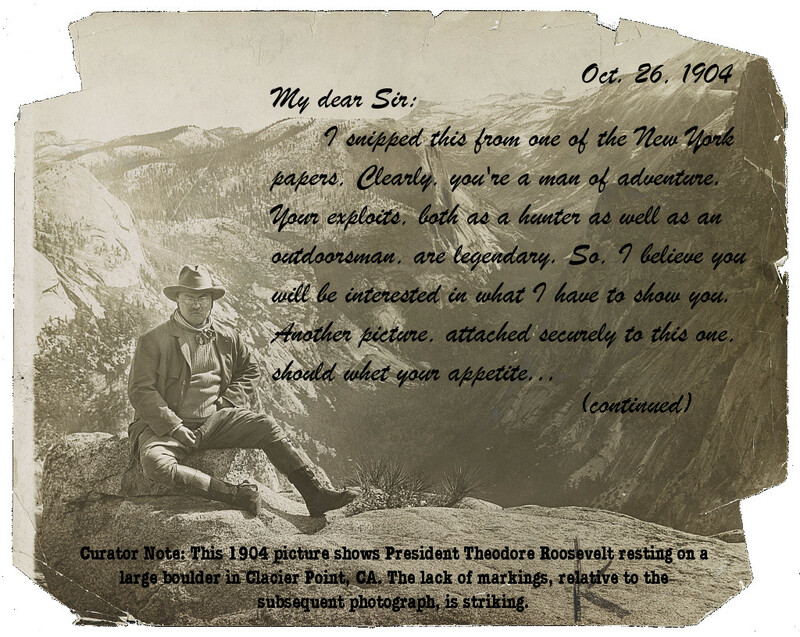 This week, we push forward with the first of two photographs, sent by Joseph Dasnoe to famed monster hunter Theodore Roosevelt. Also, while you’re waiting for Apex Predator to launch, why not check out Vapor? Over the last eighteen months, our team of dedicated researchers has been pulling together any and all documents related to the infamous Dasnoe Expedition of 1904. In the process, we’ve compiled an incredible treasure trove of old photographs, letters, and other items related to this extremely strange period of American history. And as we prepare for the upcoming launch of Behemoth, the first book in the Apex Predator series, we’re taking the opportunity to release those documents to all of you! This week, we’re publishing the first of a two-part photographic series. We’re calling this particular photograph, “Monster Hunter Teddy Roosevelt.” It represents Joseph Dasnoe’s second attempt at luring fabled monster hunter Teddy Roosevelt into the isolated Vallerio Forest in search of mysterious—and ungodly—creatures. Incidentally, the “curator note” at the bottom of this photograph was added by our research team. It will make much more sense when we release the second photo of this mini-series. Our Apex Predator site is still growing. But make sure to stop by and leave a comment. We’d love to hear from you! Have you bought Vapor yet? No? Well, why wait any longer? Vapor is the fourth novel in the Cy Reed Adventure series. As we speak, it’s sitting at #8 & #1 on the U.S. and UK Pulp Best Sellers lists and #17 & #9 on the U.S. and UK Men’s Adventure lists. It’s also the #2 & #7 Hot New Release in the U.S. Pulp and U.S. Men’s Adventure categories. Get your copy at one of the following links today! The Dasnoe Letter: Welcome to Apex Predator! We are pleased to announce the launch of our Apex Predator site! Behemoth, the first book in the Apex Predator world, is still in production. 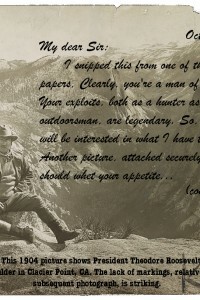 But in the meantime, we’d like to whet your appetites with a little taste of our newest acquisition, a treasure trove of letters, photos, and other items straight from the ill-fated Dasnoe Expedition of 1904. 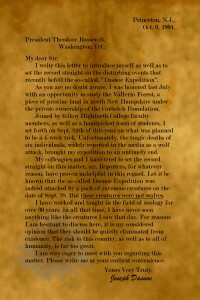 First up … the infamous Dasnoe Letter, reporting on the existence of ungodly creatures in the mysterious Vallerio Forest! And on a side note, have you bought Vapor yet? As I mentioned earlier, today marks the official launch of our Apex Predator site. Apex Predator’s origins lie in the private—and gated—Vallerio Forest. As some of you already know, famous zoologist Professor Joseph Dasnoe led a well-known expedition—reporters of the time compared it to the Lewis & Clark expedition—to the Vallerio in 1904. The expedition ended in awful tragedy and Professor Dasnoe spent the rest of his rather short life working to destroy the Vallerio and everything in it. 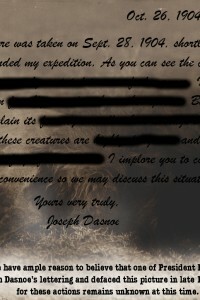 Today’s document, the recently-restored Dasnoe Letter (Professor Dasnoe’s first letter to then-President Theodore Roosevelt) hints at the ungodly creatures that once inhabited the Vallerio. 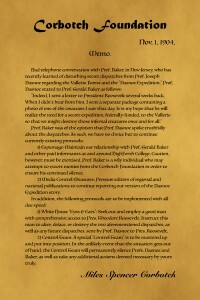 You can read the Dasnoe Letter below. At the moment, the Apex Predator site is pretty bare. Expect that to change as we head toward Behemoth’s launch date. So, stick around … there’s lots to come! Have you bought Vapor yet? No? Well, why wait any longer? Vapor, the fourth novel in the Cy Reed Adventure series, is on-sale! Get your copy at one of the following links today! Vapor is here! After almost 14 months, Cy Reed & the gang have returned for an all new adventure in Vapor. But I promise you it was worth the wait. Vapor is everything you’ve come to expect from the Cy Reed universe. Ancient mysteries, lost treasure, strange monsters, an epic conspiracy, and more! 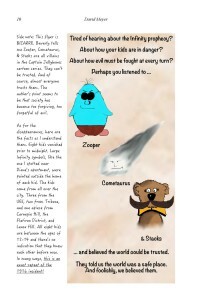 Plus, all new characters, several of which will be sticking around for future novels. A toxic mist rips across a secretive Israeli dig site, leaving Cy Reed’s excavation in ruins. As dozens of people perish, a lethal artifact goes missing. Tormented by his father’s legacy, Reed stages a daring recovery operation. At the same time, bizarre weather phenomena plague the globe. Billions of dollars vanish from U.S. government coffers. 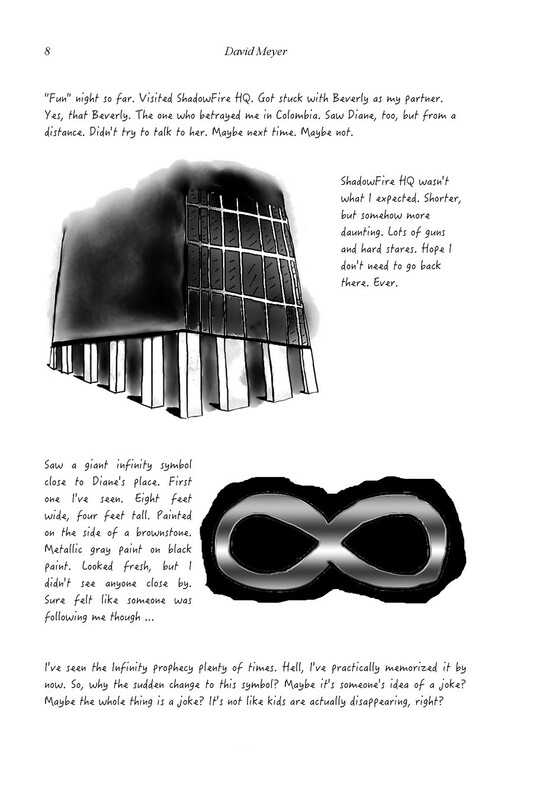 And a mysterious organization initiates a scheme of apocalyptic proportions.